What you will see here is a departure from everything you have experienced before. In the past, music video experiences have told you what to think or feel through words or visuals. These imaginary spaces here are created entirely by one person to give your mind a place to wander - think of creating a quiet space filled with sound and images that you can experience. These pieces purposefully avoid any reference to cultural or human elements. In this way, the effect of this visual music experience can cross cultural boundaries and inspire without prejudice. These visual music videos can be very meditative when experienced under optimum conditions. There are a number of very different kinds of compositions here, and each one is unique in some way. I have had many comments on the possible uses for visual music in medical recovery scenarios and doctor's offices as part of a music therapy program. Here is an article written in 2008 about my projects and an exhibit at the Bascom Center for the Arts in Highlands, NC. Visual Music has evolved into somthing wonderful. The capability of new technologies to allow this level of creative expression was not available in years past. Since there are no creative boundaries, there is unlimited opportunity for expression. The best way to experience these videos is with a good set of headphones and a good monitor. Keep the volume low and the room dark, as the music and sound is meant to support the visuals and not be the focal point. 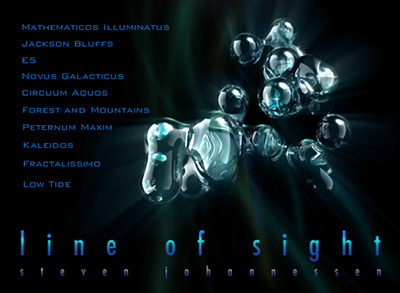 The "Line Of Sight" DVD represents my most recent foray into the exciting area of visual music composition. Working on "Line Of Sight" has been the most fun creatively I've ever had. The ability to create visual music allows me to express myself in many dimensions at the same time, and there are no creative boundaries in terms of scope and style.